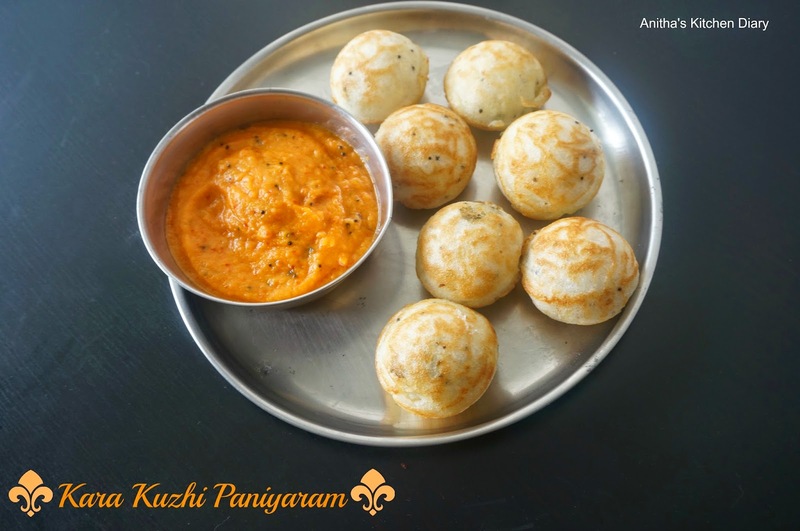 Kuzhi Paniyaram is a famous chettinad recipe. It is a quick and healthy recipe when you have left over idly batter.The batter prepared for paniyaram is same as Idly/Dosa batter. So i always prefer to use left over Idly batter making this paniyaram. It can be served either as a breakfast or as a evening snack. Heat oil in a pan , add mustard seeds,once splutter add hing , urad dal and curry leaves ,cook til urad dal become golden brown. Add onion and green chilli , cook til onions are translucent. Switch off the flame and add grated coconut if using. Take idli batter in a bowl , now add the tempered item and mix well. Heat paniyaram pan with a oil , pour the spoonful of batter into each hole and cook for 2 minutes. Turn the paniyaram on other side and cook till done. Once done transfer into the plate and do the same for rest of the batter. Serve it along chutney of your choice.